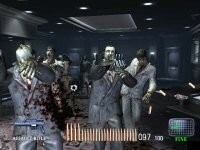 Resident Evil Dead Aim (also known as Gun Survivor 4 Biohazard: Heroes Never Die) was a slight surprise announcement made by Capcom Japan during 2002. While everyone expected another Survivor title to appear eventually, the fact that it actually looked like a heavy amount of work had been put into this title was perhaps the most the surprising part overall. According to early news reports, the game begins on a ship, and the story is based on an original unused concept originally made to have been used for Resident Evil 3. The game is also following another recent trend by Capcom of incorporating Japanese musicians in their games, with a Japanese band called "Rize" and their song "Gunshot" appearing as the title track to the game. The graphics are surprisingly detailed and clean, and the game also allows a mixed 3rd and 1st person ability (which should please the many, many people who asked about this ability in the original Survivor on PlayStation and every Survivor game since). The game also has some impressive effects that have been displayed to us such as body movement effects (being slammed back by the recoil of being hit for example) and some of the best blood effects ever seen in any videogame ever. 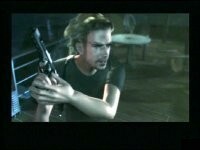 The game also contains some very decent CGI cutscenes (it is also the first Resident Evil based Gun Survivor title to do so). The Japanese release was made in Feb 2003, with US and PAL editions due to be released a few months later in June of 2003. More information on the various details of the game can be found within the links to the top left. Oh and for all the people who will ask where Gun Survivor 3 was, well it was a Dino Crisis title... released in the US and PAL areas under the name "Dino Stalker" so you've likely seen it somewhere and not known this.